This recipe for Baked Pasta e Fagioli is a fun twist on the traditional soup. Packed with pasta, cheese, and vegetables it’s another kind of comfort food! When you think of Pasta e Fagioli, you probably think of soup. 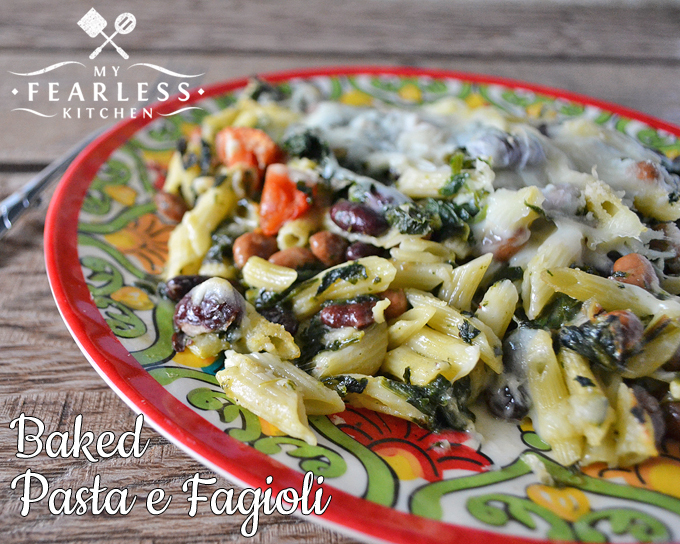 This recipe for Baked Pasta e Fagioli is a little different… it’s more like a baked ziti… with extra veggies… and no red sauce. This recipe comes from “Mom Knows Best” by Gooseberry Patch. Everything I’ve cooked from this cookbook has been a hit! Many pasta dishes can be pretty heavy, especially when they have a lot of red sauce. This dish feels a little more… dare I say… springy. The spinach and tomatoes give it such great color. And the cheese… well, you can’t go wrong with lots of melty Mozzarella! Don’t get me wrong, I love a good Pasta e Fagioli soup as much as the next person! 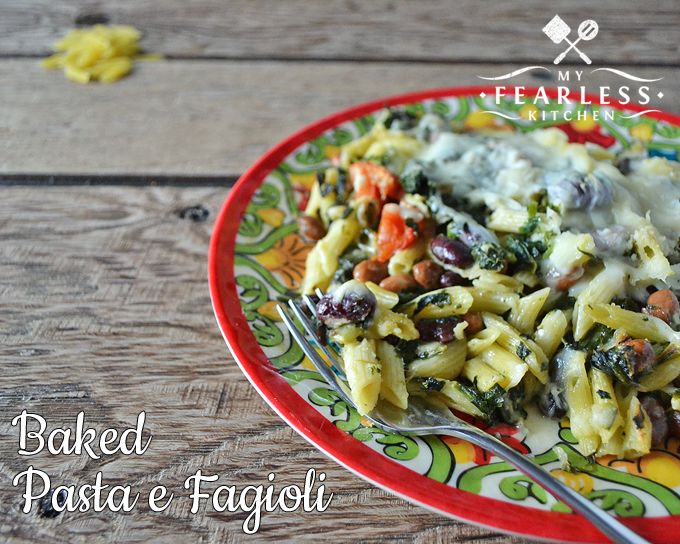 But if you’re just not feeling the soup, this Baked Pasta e Fagioli is a good way to go. This Baked Pasta e Fagioli is great by itself. There are enough veggies in it that it could be a meal on its own. Add in some Easy Homemade Bread, or a small salad if you’re really feeling the veggies, and you’re all set! This recipe for Baked Pasta e Fagioli is a fun twist on the traditional soup. Packed with pasta, cheese, and vegetables it's another kind of comfort food! In a large pot, cook pasta to al dente, according to package directions. Drain and reserve ¼ cup cooking water. Meanwhile, in a large skillet, heat olive oil. Add onion and celery; cook, stirring frequently, until vegetables are tender (5-7 minutes). Add garlic to the skillet and cook for 1-2 minutes. Stir in broth, beans, tomato, and pepper to skillet. Heat to boiling. Reduce heat to medium-low, stir in spinach and heat through. Return cooked pasta to the pasta pot. Add reserved pasta water, spinach mixture, chicken broth, and ¼ cup Mozzarella cheese to pasta. Toss to mix. Transfer pasta mixture to a greased 13x9 baking pan and top with remaining cheese. Bake, uncovered, at 400 degrees for 15-20 minutes until hot and bubbly. « Can I Refreeze Food After It Was Thawed?